Ella Fitzgerald and Count Basie Orchestra. This concert is the perfect example of how to “Swing”. 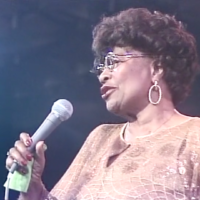 The ideal combination of Ella Fitzgerald, at the height of her powers in 1979, with the Count Basie Orchestra and then accompanied by the great man himself, leads to a sublime evening with versions of such Ella classics as Flying Home and A-Tisket, A-Tasket.